Keds and Rifle Paper Co. have teamed up to create a new exciting collection. Rifle Paper Co. is a stationery and lifestyle brand based in Winter Park, Florida founded and owned by husband and wife team, Anna and Nathan Bond. The company was originally an online business that has quickly grown into an international sensation. Although, Rifle Paper Co.'s roots are in stationary they have continued to evolve and create new products under the Rifle Paper Co. brand. This collaboration with Keds is just one of their new ventures that combines the classic style of Keds footwear with the personal touch of the Rifle Paper Co. brand. The new line consists of the traditional Keds sneaker silhouettes printed with exquisite Rilfe Paper Co. signature floral prints. Sign up for new styles from Keds x Rifle Paper Co. I'm pretty bummed. I like the look of these so very much, but they kind of hurt my feet. I didn;t figure that out until I'd already worn them outside and so no return I guess. Sigh. The back of the shoe rubs my ankle - I'm wearing those "no-show" socks, but it's not working. There is still a little shoe rubbing. Also, the front is a little narrow - I feel like the balls of my feet are being squished. And - no arch support to speak of. I'll try inserts, but I don't think the shoe is roomy enough to allow it. I really Like these. I wanted something comfy to wear with pants at work. These are perfect. My new Kids look amazing and will be a perfect for a special outdoor botanical show that is coming up. I tried them on and all seems well. Hope they are as comfy as well as they look. Keds are my go-to summer shoes. The new florals and designs this year are great. The shoe I chose has a very light green background. I wish the Keds offered a bit more support but they are comfortable otherwise. These shoes just make me happy. :) I love the beautiful pattern, and they add a happy pop to my look! I wore with no show socks. The top of the heels did slightly rub against the back or my ankle which would have make them uncomfortable if I had been doing a lot of walking, but I felt after a couple wears the back of the heel softened up and feels comfortable. These are fun shoes that fit and wear very comfortably. I have received many compliments on them and it is hard not to smile when you look down at your feet, they shout "Hello Spring!" These shoes were awful! I wear exclusively Keds during the summer, and have for years, so I was so excited to see these with the adorable Riffle pattern. I wore a Riffle pair last summer and they're some of my favorite shoes, so I thought that these would fit the same. These are SO uncomfortable. The fabric is really stiff and they don't bend with your foot when you walk, so the top of the shoe rubs against the top of your feet. It's absolutely ridiculous and I don't know how anyone would be able to wear these. I'm so disappointed. I ordered these in my normal 7.5 size and they were a tad too large. The size 7 fits me much better. These are adorable! I need good arch support and these shoes provide just that. For the first time ever in all the years I've shopped on Zappos...they let me down. I've been watching for this shoe which they claimed was out of stock. Miraculously.. a couple of days ago..they claimed they had one in stock...so I ordered a size 7...and they sent me a 7.5 unwrapped in a zappos box not a keds box. They are WAY too big...and I will be returning them. Bad move Zappos. These shoes are SO narrow and I have narrow feet! They were too small in size 10 which is what I normally wear. However, they were small because they are so narrow in the toe box. The 11 flopped around on my feet. So bummed because they are very cute shoes. Had to send both pairs back. I typiaclle wear a 7.5 or 8 and the 7.5 were good for me. My foot is a bit slim and the width works well for me. There is no real arch support but Ialso have slightly high arches. The fabric is a bit stiff, too, but SO CUTE! The photos do not show the extra set of laces that are the print fabric! Loved that! I'm still thinking on these and will be trying them on a few times to be sure how I feel about them. I loved the style of this shoe, but i couldn’t keep it. I ordered regular width but it was very narrow. I was so excited about these new shoes - but the only width available was 'B' and they were really narrow. I'm disappointed that there wasn't an option as I usually don't have to worry about the width of the shoe. Very narrow! Comfortable and very cute shoe with a choice of laces (other laces are white). My usual size is 10. These are a perfect fit in 9 1/2. Very attractive, just the right amount of color with the cute laces and matching interior. The canvas is soft and flexible so they are great to wear! 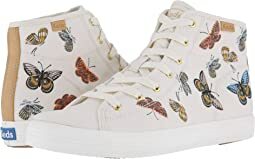 Keds fit my narrow heel/broad-toed foot really well, without being clunky, and these are cute and fun with the print and laces, but there's no cushioning on the bottom, so they're just not comfortable enough for a tennis-type canvas shoe. I've returned them. I go for the Triple Kick instead---same fit on the upper as these, but the platform cushioning on that shoe gives the feel of plenty of arch support. With the Triple Kick, though, it's either all-white or all-black; how come Zappos doesn't sell interesting laces so we can create our own fun shoes? Why do these very cute shoes not come in 6 WW? Please do not discriminate against us wide-footed people! These Keds x Rifle Paper Co. Triple Decker shoes are comfortable. Width was a bit narrow according to the person I purchased these for. The embroidery detail was very nice and well done on the pair received. The shoe box packaging was also beautiful with a matching design to the flowers on the shoe. I love the look of this shoe and wanted them to work on my feet. However, the heel of the right shoe slipped and the material felt rough against the top of my toes on the left foot. Wish they had worked, but not for me. These are beautiful shoes. The embroidery is awesome! I really liked the triple decker height and it didn’t feel like I was walking on a tower. Highly recommend for running around during your day. I love the look of the shoe, and the length was just right. But the show is pretty wide and my feet didn't stay in while I walked. So sad to see these go.